Bold, and spicy is what defines this chicken curry; a very aromatic dish that heavily pronounces the flavors from the south western part of India – Kolhapur; a recipe as vibrant and rich as the history of this ancient town. Kolhapuri Chicken has always been a favorite, “give me more” kind of dish in our home; but I never did cook the real thing until one day I discovered that the well trusted “Parampara” brand chicken Kolhapuri spice mix is not in my pantry. I was all set and prepared to cook with the store bought spice mix. Well if I am set to do something, I will do it – “Parampara” or not. I went about making my own Kala masala; it was close, but not perfect as I did not have a few ingredients that the traditional spice mix uses. The Kolhapuri paste was not that difficult to do. 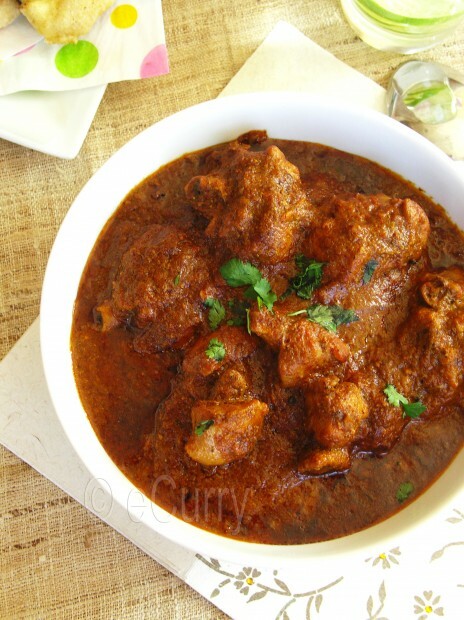 The two homemades combined made the most delicious Kolhapuri chicken curry. 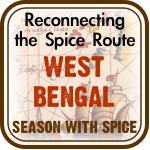 If you are missing a few ingredients from the spice mix in your pantry, do not fret. Indian cooking is very liberal and provides a very wide horizon that helps one to personalize the dish. The curry will still be sensational if not originally true. However you will definitely need the peppers, fresh cilantro, tomato and the coconut to make it “Kolhapuri”. Don’t forget H2Ope for Haiti! The raffle is open and live now, and will run till the 28th of February. Buy ticket for minimal price and you and win $50 Amazon gift card (my donation), or any other wonderful prizes listed there. 2-3 tablespoons Spice Mix/Goda Masala or Kala Masala Mix (Recipe Below) – May use the store bought powder too. Heat very little oil in a pan and very lightly fry the ingredients mentioned in the “Light Fry”at low heat for a couple of minutes. Switch off the heat when they get fragrant. Do take care and watch like a hawk, for they will burn very quick. Dry roast the coconut and sesame seeds for a couple of minutes, till the coconut is very light brown. Blend in a spice grinder or coffee grinder all the ingredients of the “light fry” and “dry roast” in a powder. Note: This spice mix is not exactly the kala/goda masala mix. I did not have all the ingredients that the authentic mix asks for; this was pretty close. If you do not have all the ingredients, just skip them. The taste of the curry might vary a bit but it is still going to be good if not 100% traditional. Marinate chicken with yogurt, turmeric, salt, chili powder and spice mix for at least an hour (I left mine overnight). Remove the chicken pieces from the marinade and brown them in the heated oil on both sides. they should be light brown; does not need to be evenly brown. Save the marinade. Remove the chicken pieces and save the leftover oil. Heat 3/4 cup oil and fry the onions, ginger, garlic, sugar and salt till the onions are brown and starts to caramelize. Switch off the heat and transfer half of the onion mix from the pan to a blender or food processor along with the fresh cilantro, coconut, tomato paste, water and the left over marinade and blend till smooth. In the remaining half of the fried onions in the pan, add the chicken and toss them and cook them for about 10 minutes at medium to high heat. If the spices stick at the bottom of the pan, do not worry. Just sprinkle some water and scrape it off . Add half of the mix from the blender to the chicken and the leftover oil from frying the chicken if you have any) in the pan and stir everything gently. Cook/simmer for about 10 – 15 minutes at medium to high heat. When you see the sauce reducing pour out the rest of the blended ingredients in to the pan. Gently stir everything together for them to combine. Cover and cook at low to medium heat till the chicken pieces are tender. Uncover and increase the heat. Add the coconut milk. Cook till the oil separates (you will see the sauce sizzling and bubbling and the little wells of oil on the sides and the top layer) for about 15 minutes. There should a considerable amount of sauce/gravy left; it is going to be a thick sauce which readily coats a spoon. The flavor of this dish matures with time. Let it sit overnight if you can before you serve it. Serve hot with Basmati rice or Indian Flat Breads. Spicy, robust and delicious. This is the kind of recipe that will make the aroma waft and dance around your home and linger in air, and the taste that makes you want more and go back and cook it again in a few days time… if you enjoy Indian food and strong flavors, this is for you. 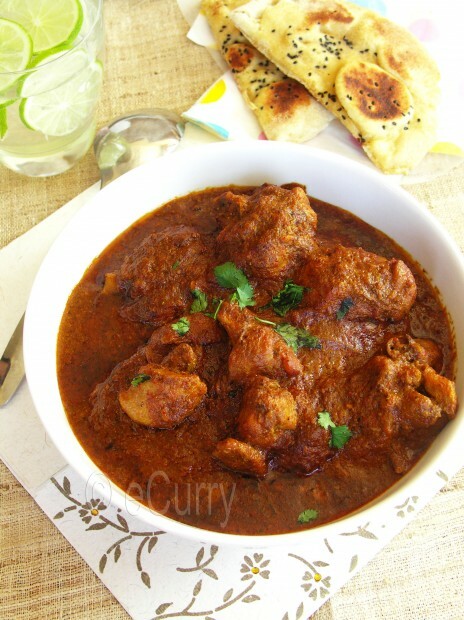 This delicious Chicken Curry from India is my entry for the BloggerAid-CFF – Culinary Olympics.Exotic spices, bold flavors, rich and spicy is what generally defines a “Curry“. Here is Curry demystified… read all about it! We might not be athletes, but our “SPORT is FOOD” as Giz and Val puts it. 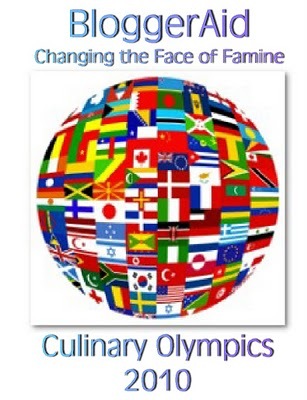 So let us all participate and show the national pride in our own countries and cuisines. 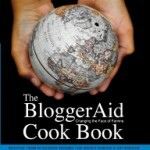 Bloggers from all over the world joined together to create the beautiful BloggerAid Cookbook, bringing the world a little bit closer to each other. The book can be purchased at CreateSpace. Buy it for yourself for a treasure in your kitchen library or for a gift for your dear friends and family. I like your descriptive of this dish…”a give me more” kinda dish. Chicken dekhe jive jol asche…Mone hoche Polao niye taar opor chicken diye boshe pori..
What a flavorful dish! No wonder you love it. It must taste incredible! Ooh! That’s exactly what we need here now on a cloudy and rainy day, a spicy and red hot Kolhapuri Chicken, Looks great! Woah!!! My goodness! This is exactly why I subscribed to your blog…for these types of dishes. Wow! How is this dish different from Murgh Makhani? I’ve been wanting to make that, and the list of ingredients for this dish look very similar. I know that you have to make tandoori chicken first and then the sauce, but beyond that, what is the difference? This dish is very different from Murgh Makhani. Murgh makhani is based on a butter tomato sauce. As you said in murgh makhani the chicken is first marinated in spices and then grilled. The base sauce used for murgh makhani is the makhani sauce ( I have the recipe for the base sauce posted here: http://www.ecurry.com/blog/basics/the-basic-gravies/). I will post the murgh makhani recipe sometimes.. I have that in mind since it is one of the popular Indian dishes. Man! and that drink and naan look so perfect for this dish. I want the drink right now. You would never know that I just got through eating haha. yummy…my favorite and regular chicken curry in the house !!! I am sure going to try this oe..awesome curry.. The color is mesmerizing Soma! U just make me grab the bread and dig ur bowl! Such fantastic flavors and I love the spice! That’s a perfect bowl of drool worthy Delicacy….I wish I was able to taste it..even if just a bit..sigh ! Hey but do you think Paneer will do justice to the Gravy if I used that instead of chicken.Expecting some Guests(Vegetarian) in a day or so, and just don’t want to make that boring Butter paneer masala again. 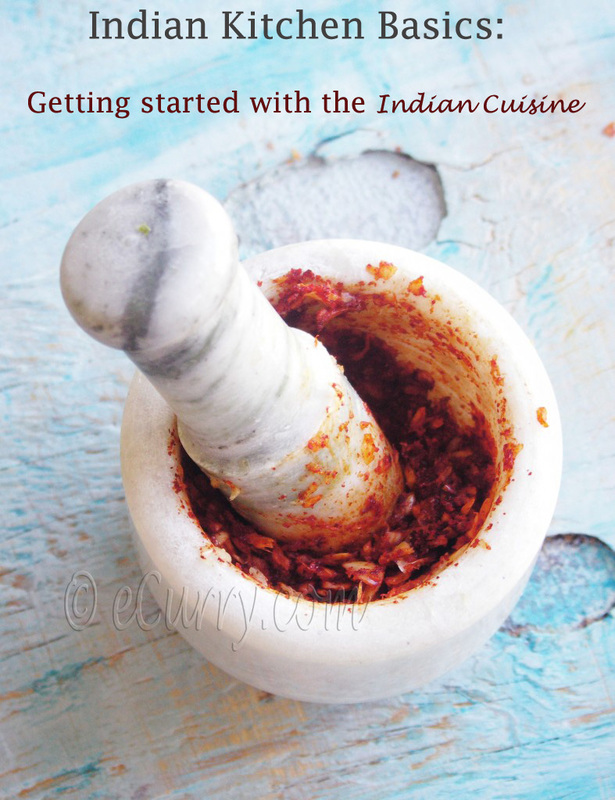 Also do you think preparing the Goda masala a day or so ahead will make it lose the flavors? 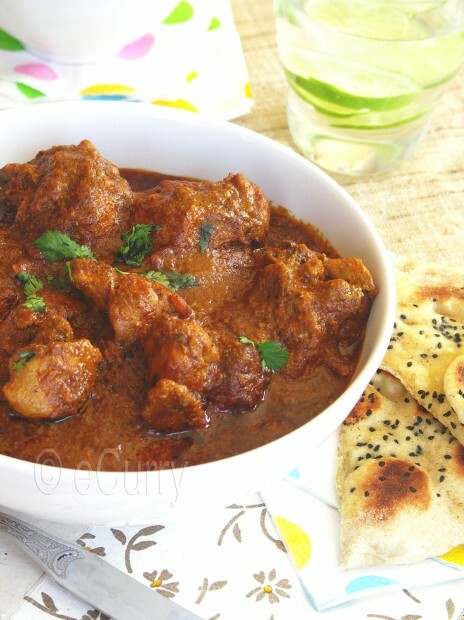 delicious photo of my favorite chicken curry! Well by the looks of that gorgeous bowl this must have been absolutely delicious. I love most curries and this kolpahara sounds wonderful! I wouldlove to have this super delicous curry any time of the day. 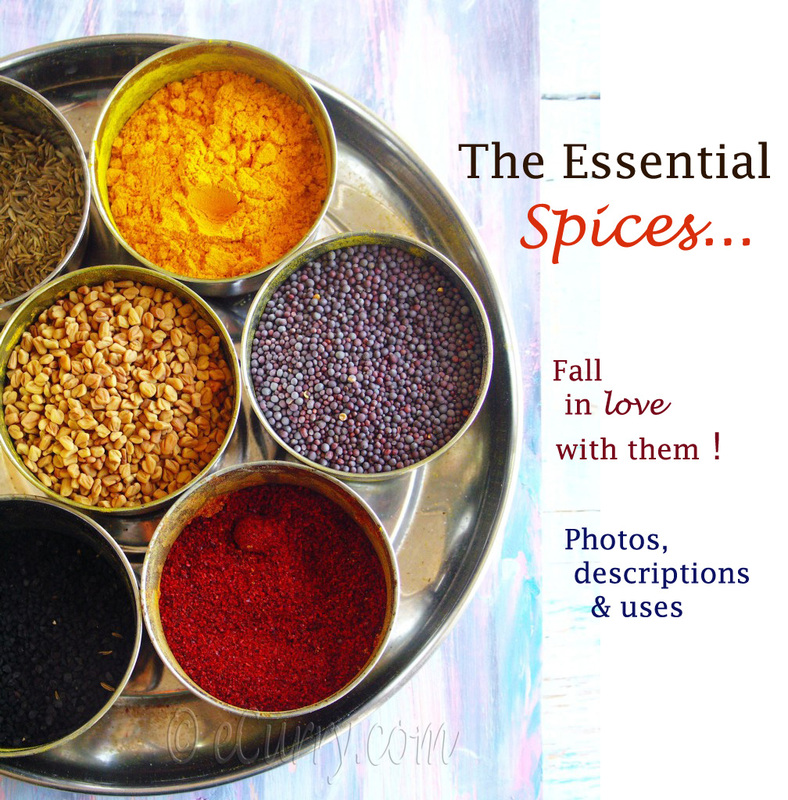 Btw, what is the traditional goda masala/kala masala recipe? mouth watering chicken! I love spicy chicken or meats and this looks perfect to my palate! Soma. that is fantastic looking. I just came from Miri’s where she talks about Kolhapur and here you are with a chicken recipe that looks like I have to get some chicken right away. Also glad to see you got your mojo back. Making your own mixes is always very rewarding. I love bold and spicy so I know I’d love this dish. I make mutton kolhapuri for Hubby and make my own Kolhapuri masala too. this dish looks very temting. will give it a try soemtime. This represents your country deliciously Soma. Thank you so much for participating. oo yes, give me more please! Wow!! !That looks rich and delicious! I love your pictures as usual. A wonderful flavorful bold dish! 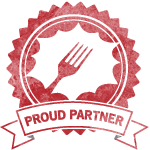 This looks fantastic– your family is so lucky–all these delicious incredible meals. I’ve always wanted to try chicken kohlapuri and now I got t recipe. The pic looks very inviting. Very nice recipe. The way you describe it makes it sound so irresistible! I like the idea of letting it set overnight for the flavors to develop. It sounds spicy and so delicious. This looks really delicious! I like your advice about using what you have. I used to just abandon a recipe if I didn’t have all the ingredients, now I try to work with what I have. I tried this today and it came out real fantastic. One thing I noticed though is the color of my dish was not as red as in the picture. Any tips pls ? But the taste was really good and Thanks for the wonderful recipe. It’s sure is a keeper. a crispy and yummy chicken recipe..tnx anyway..
Hey , I am trying your recepie today …have mad the goda masala without nutmeg and methi!! and also can you suggest an alternative for Coconut milk? Hey!! the gravy and chicken have turned out AWSOME!! amazing flavors..but the color is not as red as yours!! any suggestions for the color?? Good! glad that you like it! About the color, someone else mentioned that too. I am not sure – I usually use Kashmiri Chili Powder which has a very deep red color, but not as spicy. Could it be that? or may be the canned tomato paste that I had used or may be a combination of both. I wanted to tell you that after the entire process the color of the dish was 95% like yours and the chicken tasted best the next day :-). Can’t we add green chillies to it to make it more spicier? You can add whatever you can!! make the recipe yours. There are no rules binding you here. This looks amazing.We will be making it for lunch!yum! I made this last night. the only ingredient I did not have was sesame seed. It was the best I ever made. It was very much like the one we had in london @ Masala Zone. Thank you for super recipe. I tried this dish last night. The texture of the gravy came out so nice and all the best thing was the flavours . I cud taste each nd every flavour . Thanks alot for posting . OMG i have just made this absolutly beautiful tasty curry exactly to the recipe!! i will definately be making it again. thankyou. I have just made CHIKEN KOLAPURI it has come out tooo good. actually I am from mumbai,usually make kolapuri, but today its awesome. I was on the lookout for this recipe without knowing its name and with your recipe I hit the jackpot. I would like to include this recipe in my blog with full credits given to and linked to your site. I want to get your permission before I prepare it 1 more time for your blog. This dish is awesome guys.. I made it word for word from the recipe and its friggin awesome..
Five August Favorites… What are Yours? 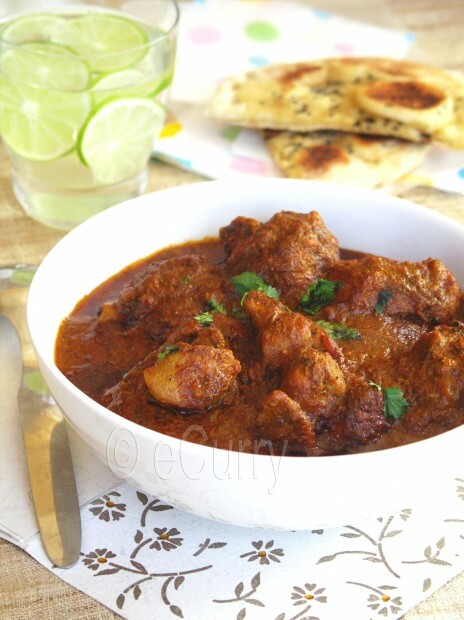 if i wanted to use a different meat for my kolhapuri would i just use the same recipe? Yes it would be the same recipe. Except the cooking time will be longer with beef/lamb/goat etc. Make sure you stir often to prevent sticking of the spices as it cooks. Another alternative and it is not at all traditional, but I do it often at home to fasten the cooking, would be to precook the meat before starting to cook. you can precook until they are 1/4 or half done (this method will help if you are using a pressure cooker).. which will take less than 15 minutes in a pressure cooker. Then remove meat from the cooking liquid and proceed with the browing and save the liquid and treat it as you would treat the marinade. If you do now own a pressure cooker, it does not make sense to pre cook as it will take the same time. 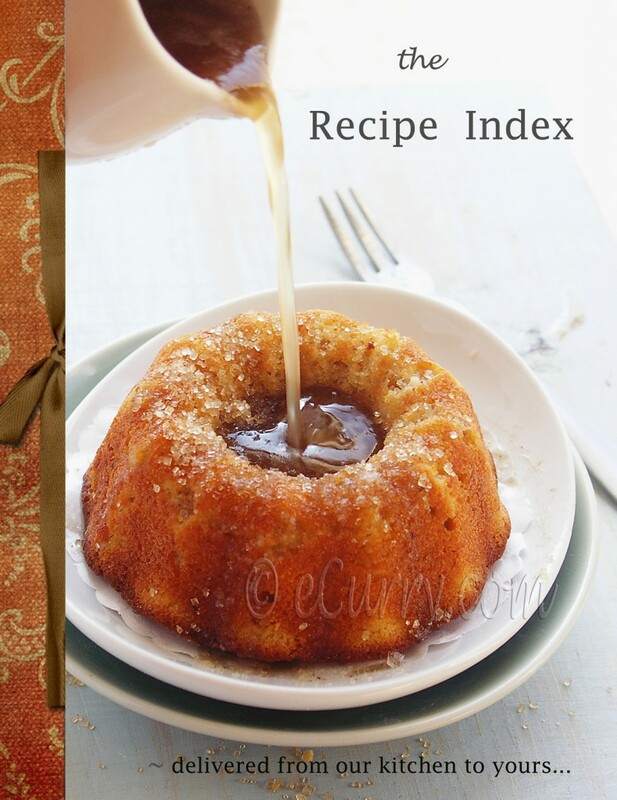 I have publised your recipe in my blog with suitable links to your post. I had taken permission from you to post this recipe a few months back and you had agreed to it. Please let me know if there is anything in my post that upsets you. I will be happy to change it. Thanks once again for sharing this wonderful recipe with the whole world. It is always delicious. Your recipe looks great. It really does, and this is not a criticism of that recipe. It is a criticism of the actual dish in general and that is – Kohlapuri Chicken tastes simply disgusting. It is the single most disgusting dish in all of Indian cuisine creation sadly and I think it is made so because the general spice mix is way too overpowering to the point where it’s even really bitter. But hey your recipe looks great, and as I said this isn’t a critique of you or the recipe, in fact maybe who knows your recipe may even make this bad dish into something that actually tastes half decent. It’s just that I wouldn’t waste your talent and a good chicken making this hiccup of an Indian dish. It’s like the Middle West of India tried to dabble in traditional South Indian Cooking and got it terribly wrong…terribly terribly wrong. hello,i just read recipe,n comments,i think i shuld try this recipe. Made the curry last night, Total taste sensation although couldn’t get one or two ingredients! I would recommend this if you want an authentic South Indian experience. If I was to cook this again, I would not put the chilli powder in. We like mild to hot curries but that is ridiculously hot and I only put one tablespoon of chilli powder in. We couldn’t eat it. I am so sorry you could not eat this. When I blog about a recipe, esp. a traditional Indian one, I try to do it as close to the authentic – just the way it is supposed to be, in its true self. Since Indian cuisine is so varied and so region specific, I want to do the real thing. But that does not mean the recipe cannot be changed or adapted if you want to try it. I think the original version is even more spicy than the fiery kind I made. Please use the recipes as a framework and make changes to suit your taste. The chilli powder just adds heat. This recipe has intense flavors for it uses an unique combination of spices and that is what is special about this, not the heat of the chilli powder. Even if you leave it out, the flavors will still be the same. Or you may use paprika for less heat while keeping the colors intact. I use Kashmiri Red Chili Powder, which has less heat, but again that relative. if we dont want to use coconut cream what can we substitute. your recipes look so nice. would try them..
Looks great, hoping to try it soon. Just need to know if tomato paste can be substituted with tomato puree? If so, how much? Thanks. Yes it can be 🙂 will just take longer to cook down and the curry might have a less deep color. I would assumer about 3-4 cups puree approx… not exact, but will work. i love your blog. such great recipes. for this particular recipe can we skip coconut milk? what could be the substitute. The authenticity will be lost in this recipe without the coconut milk. However if you really have to, I am thinking Almond milk right now. and maybe finish off with a little lemon juice? I really do not know! It will be a completely different flavor.